The mechanical overhaul of our engine has slowed for a few weeks while the SVR staff concentrate on completing the overhaul of Standard 4 75069 before the end of the year. 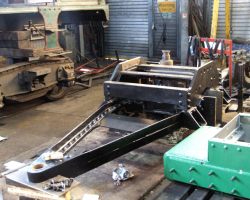 SMF volunteers continue their tasks however, and one of these was to remove and dismantle the drive linkage to the mechanical lubricators, the bushes to the mainshaft being very worn. Further work on the lubrication pipework also continues, concentrating on the cab area. We have a very high class of workbench at the SVR! 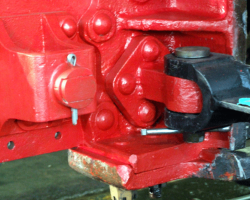 A further task undertaken was to track down every pin joint on the loco and ensure it had a new, correctly sized split pin. These have not been opened out as many of the pins will need to come out again, but are already in place saving time when the time comes. Work on the pony truck is also underway, although this has largely concentrated on applying coats of paint before parts are refitted and making large areas inaccessible. 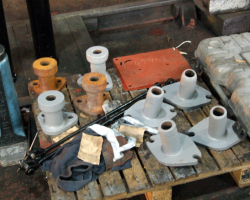 Various parts of the truck are in the early stages of painting before being returned to their rightful places. Although the inside frames had been painted a while ago, the work on the frames repair damaged much of it, and this is now being made good. Here is the area adjacent to the firebox and, unlike the vermillion elsewhere, is black. The very thorough job will not be visible once the boiler is back in place, though. 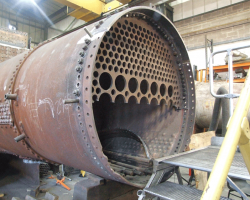 SVR staff might not be available in the main workshop, but it’s a different story in the boiler shop, where work advances rapidly. This is a distant view from the rear. The removal of the backplate reveals parts not normally seen. 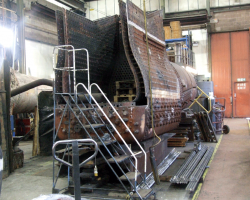 This shows the steel outer firebox extreme right, with the inner copper firebox extending downwards from top middle, to turn left towards that edge. Rising up from the bottom are the crown stays, the rear two rows are riveted in the firebox’s fire space; all those forwards of this have nuts. 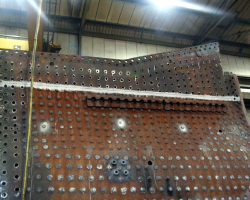 A few of the transverse stays between the two sides of the outer firebox are seen running across the bottom of the photo, while another stay joining the inner and outer wrappers is visible to the top right. 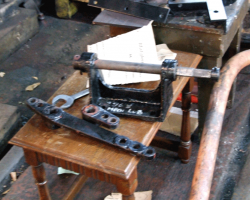 Also seen are two of the longitudinal stays connecting the backplate to the front tubeplate. The lower sidesheets, at the top of the photo, on both sides are to be replaced. The stays have all been removed and the cut lines marked. As previously reported, the bottom section of the throatplate is also to be replaced. 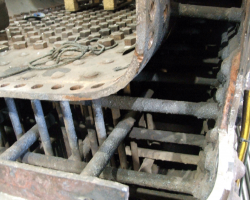 In this case, not only are the stays removed but so too is the original steel section. 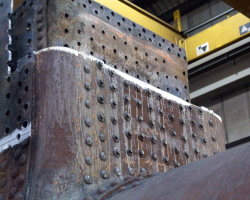 Again as reported, a small section of the front boiler ring is to be renewed, and here’s the new metal in place. It will not be welded in until the new front tubeplate is fitted, so ensuring that no distortion from the heat of welding occurs. 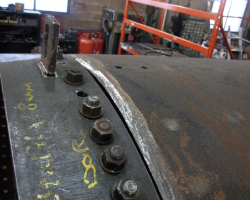 Most of the old front tube plate is still to be removed, but work is well underway.